OVER HERE at team Acres, we argue on the merits of Chicago itself, but we agree that the Chicago Alternative (K)omics Expo boasts the most accommodating staff, and a star-spangled exhibitor list. Five years in, after attending all but one CAKE since 2012, we declare it a can’t-miss comics show. This year, CAKE brought the extra classy by introducing helpful pronoun stickers (She, He, They, and a blank one for any other preferred pronoun), and designating itself a safer space. We love you, CAKE. Yes, homo. Flight delays prevented us from doing anything fun on Friday night, but we woke up ready to sling comics on Saturday morning, all of our boxes safely waiting for us at the table. Our old and hot pal, CAKE’s own Jessica Campbell, greeted us at the door, Neil Brideau helped us score some change, and, half a table away, we found our guy, Sean Ford, with tablemates Chuck Forsman and Michael Fiffe. Keren Katz joined us at chez Acres with her debut graphic novel, the Academic Hour. We sold out of damn near everything by mid-day Sunday. That left us time to check in with old friends and check out the new kids. We said hi to Tom Spurgeon and enjoyed his spotlight panel on Fantagraphics hitting the big 4-0, which included Anya Davidson, Noah Van Sciver and Ivan Brunetti. John Porcellino showed up, dropping Spit and a Half‘s first publication, the classic and finally Complete Strange Growths by Jenny Zervakis. Welcome to the publishing game, John! We mourned the absence of Annie Koyama and Chris Pitzer, our regular con cohorts, but we met Eric Kostiuk Williams at the Koyama table and grabbed a copy of his sensational Condo Heartbreak Disco. We snatched the Shirley Jackson Project, a collection of comics inspired by Shirley Jackson, edited by our friend, Rob Kirby from Minneapolis. We chatted up Conor Stechschulte, Ethan Rilly, Gabrielle Bell and the ever-charming Jordan Shively, also from Minneapolis. All these people making relevant work, and practically all of them over the age of thirty! Wonders never cease! As for the younglings, we found a new comics crush in M. Dean from Brooklyn, and her gorgeously-crafted Baby Fat. No leering intended or implied. We caught up with our old lady, Corinne Mucha, snagged a copy of her mini My Cat Is An Artist, and sat in on her Comics 101 Workshop. The divine Ms. Katz participated in the workshop and accomplished quite a bit in a single hour, creating the character, Happy Farmer Lady Bug and co-creating a disturbing comic where poor Happy Farmer Lady Bug is forced to face Hungry Snake Wedding Planner. That happened. We failed on the party front, since we’re getting old and crotchety, closing in on a decade of Secret Acres, but we did share some beverages with buddies on the deck of the Center on Halsted Sunday night. 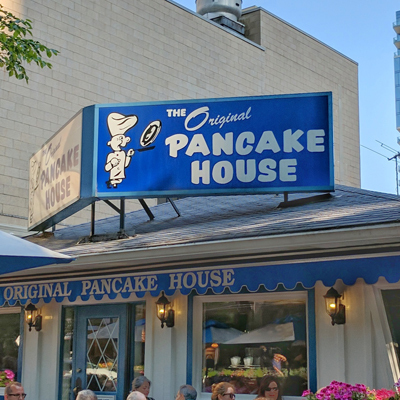 Obviously, we made a little time for some goodbye pancakes before taking a Monday morning flight out of the windy city. Thanks to everyone at CAKE for making us welcome and letting us chill with our favorite weirdos for a few, lovely days. We promise to party with you in September, what with the Small Press Expo lurking around the corner. 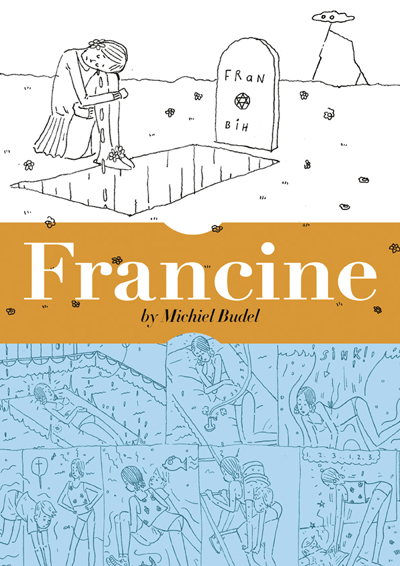 We spilled the beans of the return of Michiel Budel to the USA (poor thing must not be reading the news), with his new main squeeze, Francine. Joining Michiel for Bethesda’s finest hour will be Ms. Katz, Gabby Schulz and Rob Sergel. Plus, expect an invitation to a shindig, on the eve of our journey to the Marriott, in our hometown of Brooklyn. We’ll return before then with all the juicy details. Meanwhile, we’re going swimming.